I am a guy that 7 and 8 figure industry leaders call a friend. To me a job is not just a means to end, it is an opportunity to reach out and touch someones heart. Life is not too short it is the longest thing that we will ever do. Time is the most valuable resource. It matters not how much of this precious resource we have but rather what we do with it. Locate and attach appropriate files to incoming correspondence requiring replies. Operate electronic mail systems and coordinate the flow of information, internally or with other organizations and other organizational leaders. Coordinate conferences, meetings, and special events. Develop and maintain Web sites. Manage projects or contribute to committee, team work. 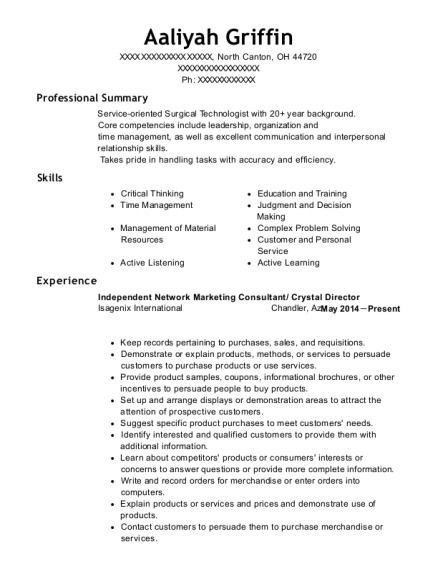 E-Mail newsletters, promotional material, or other information. Prepare conference or event materials, such as flyers or invitations. Answer telephones and give information to callers. Determine advertising medium to be used, and prepare sample advertisements within the selected medium for presentation to customers. Identify new advertising markets, and propose products to serve them. Maintain customer bases while Acquiring new customers. Provide clients with estimates of the costs of products or services. Process all correspondence and paperwork related to accounts. Draw up contracts for construction of work, and collect payments due. Gather all relevant material for bid processes, and coordinate bidding and contract approval. Attend sales meetings, industry trade shows, and training seminars to gather information, promote products, expand network of contacts, and increase knowledge. Approve and sign plans that meet required specifications. Train, direct, or supervise other inspectors. Approve and sign plans that meet required specifications.Review and interpret plans, blueprints, site layouts, specifications, or construction methods to ensure compliance to legal requirements and safety regulations. Inspect and monitor construction sites to ensure adherence to safety standards, building codes, or specifications.Train, direct, or supervise other inspectors. Found on the first page of Google and YouTube in multiple categories related specifically to skills, tools or education needed to perform specific functions in business. 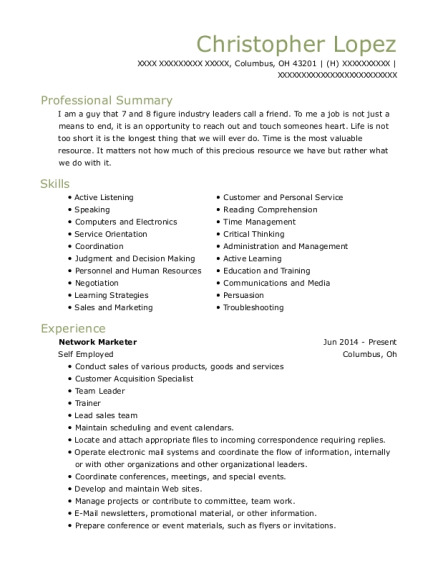 This is a resume for a Network Marketer in Columbus, Ohio with experience working for such companies as Self Employed and Ohio Builders. 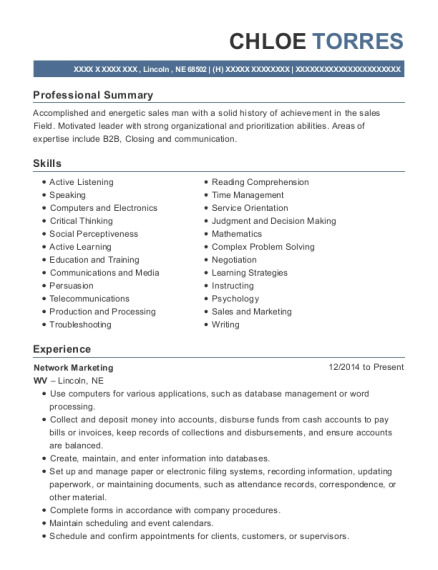 The grade for this resume is 0 and is one of hundreds of Network Marketer resumes available on our site for free. 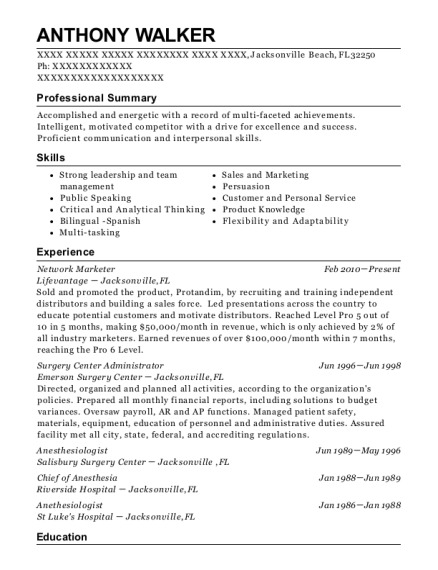 Use these resumes as templates to get help creating the best Network Marketer resume.